News from LMCU: Everyone’s favorite LMCU product! Most banks don’t pay any interest at all on their checking accounts. Most even charge a monthly fee for the privilege. 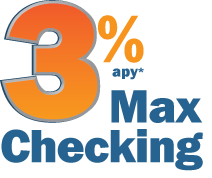 Even money market accounts and CDs don’t pay anywhere near the 3% APY* of Max Checking. Yet, with no monthly or annual fees, no minimum balance requirements and free ATM use, you can still reap a 3% APY gain on up to $15,000 with just a few minor usage requirements. It’s one of the very best rates in the country, and it’s a very tangible expression of how we give back to our members. Call us at (616 or 800) 242-9790, open an account online at LMCU.org or stop by any branch to get started.